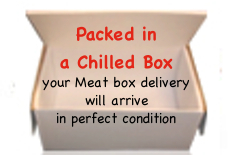 In order to ensure that your fresh meat delivery from our quality butchers at Smithfield market arrives in perfect condition, they are shipped in high quality, durable, temperature controlled packing boxes. The packing boxes have been specifically designed to ensure the contents are kept below +5ºC for a period of 48 hours, to ensure a perfect fresh meat delivery. The containers are lined with 13mm polyethylene, which is designed to provide effective insulation whilst protecting the contents from any potential impact that may occur during transit. They have been carefully designed by the manufacturer for use by food suppliers and are ideal for use in the transportation of fresh food and other perishable products. Your fresh meat delivery from Smithfield market, will arrive in perfect condition having been kept at the optimum temperature throughout the journey.